Join us on Monday, November 12, 2018 at 6:00 pm at NIU Naperville (1120 East Diehl Rd, Naperville, IL) for a free screening of Chasing Coral. The screening will including a Q&A session with Dr. Mark Eakin from NOAA and a Chief Scientific Advisor on the film. Coral reefs are the nursery for all life in the oceans, a remarkable ecosystem that sustains us. Yet with carbon emissions warming the seas, a phenomenon called “coral bleaching”—a sign of mass coral death—has been accelerating around the world, and the public has no idea of the scale or implication of the catastrophe silently raging underwater. Enter Jeff Orlowski, director of Chasing Ice, which created irrefutable, visual proof of the melting ice caps. Orlowski’s next project is similarly evidentiary and powerful. Chasing Coral taps into the collective will and wisdom of an ad man, a self-proclaimed coral nerd, top-notch camera designers, and renowned marine biologists as they invent the first time-lapse camera to record bleaching events as they happen. Unfortunately, the effort is anything but simple, and the team doggedly battles technical malfunctions and the force of nature in pursuit of their golden fleece: documenting the indisputable and tragic transformation below the waves. 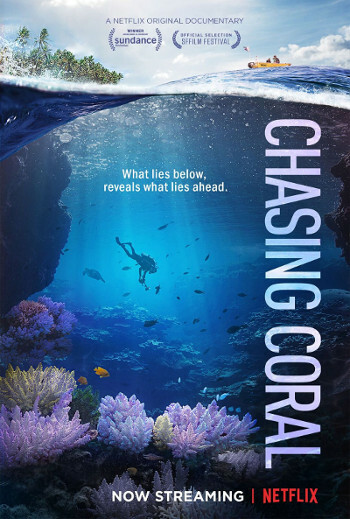 With its breathtaking photography, nail-biting suspense, and startling emotion, Chasing Coral is a dramatic revelation that won’t have audiences sitting idle for long. This event it open to the public with pre-registration strongly requested. (May be turned away if full.) This is an excellent opportunity for science educators, students, and parents to learn about "coral bleaching" and the impact on our oceans.